Regular visitors to the Craft Yarn Council web site will remember Noreen's name. Last December she presented us with a very special holiday gift, a delightful doll pattern entitled "Elspeth." She is the author of "Soul Mate Dolls: Dollmaking as a Healing Art," a wife, mother, designer, doll artist, as well as a workshop facilitator and a professional puppeteer who presents hundreds of shows to children every year. Our gift from Noreen this year comes a little earlier, but just in the nick of time. After the devastation we all witnessed this fall, Noreen felt we all needed something warm and cuddly. The following is Noreen's Comfie Bear pattern and her own special message. Give them with love. . .
On September 11, 2001, as I sat and watched the attack on New York, I, like the rest of the world was aghast. As the horror unfolded, I felt the need to comfort myself, and to find a way to comfort other people. Teddy Bears are in many ways the symbol of comfort, tenderness, mercy and compassion. I began working on a design for a tiny Teddy bear that would embody these feelings. It was important to me to design a bear that would be fast and easy to make so that I could make many, many, many of them and give them to whomever needed comfort. I also wanted to be able to share the pattern with as many people as possible. This way, they could make little Comfort Bears and share their love, as well. And so, I am offering you this pattern for the crocheted "Comfie Bear". The size of the bear will be determined by the size of yarn or thread and hook that you use. Either way, whether carried in a pocket, or worn on a lapel, they are offered as messengers of love. Please feel free to make as many as you would like, but please, don't sell them. Please, give them with love. I will be including this pattern in my new book, which is being published by Krause: "Comfort Crochet: Crocheted Dolls and Toys From the Heart, For the Heart." The size of your hook and weight of your yarn will determine the gauge of the crocheting, and the finished size of your bear. When made with Patons Decor, a worsted-weight yarn, the Comfie Bear is approximately 3 inches tall. When made with Embroidery Floss, it is approximately l inch tall. In order to make this bear, you will need to know how to make a chain, slip stitch, single crochet and double crochet. Larger bear in photo was made with 1 skein of Patons Decor Taupe Heather. 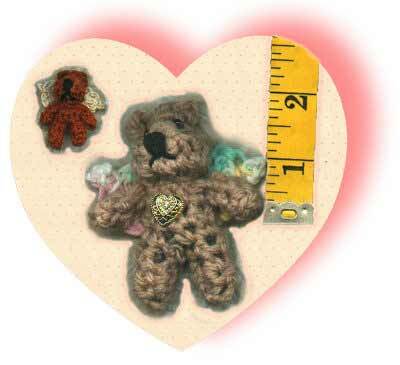 Smaller bear was made with 1 skein of brown embroidery floss, using one strand. Approximately half an ounce of worsted-weight yarn. Smaller bear was made with brown embroidery floss. fine brush to paint nose and mouth if preferred. * to *= you will repeat the instructions that appear between the two"*" signs however many times stated in the pattern. Ch 5, leaving about 4 inches of yarn at beginning of ch. This tail will be used to sew the legs up later. Row 1: Sc in 2nd ch from hook and in each ch to end. (4 sc). Ch 1 and turn. Row 2 & 3: 4 sc, ch l, turn. Cut yarn, and draw end through last ch l.
Repeat Rows 1 - 3 for the second leg, but do not cut the yarn. Ch l and turn. Row 4: Work l sc in each of the 4 sc of second leg, then work l sc in each of the 4 sc of the first leg. (8 sc). Ch l and turn. Row 5 & 6: 8 sc, ch l, turn. Row 7: Sc in lst sc, (ch 2, sc in next sc)7 times. (7 ch 2 spaces formed) ch l, turn. Row 8: 2 sc in each ch 2 sp (14 sc) ch l, turn. Row 10: sc in lst 2 sc,(insert hook into next loop, yo, pull through st)3 times, yo, pull yarn through all 4 loops on hook, sc in last 2 sc. (5 sc) ch l turn. Row ll: 5 sc, ch l. Cut yarn, leaving a tail of about 10 inches, pull yarn end through last ch l.
Row 1: Ch 4, sc in 2nd ch from hook, sc in each remaining ch. (3 sc) ch l, turn. Row 2 and 3: 3 sc, ch l, turn. Cut yarn, leaving a tail of about 4 inches, pull yarn end through last ch l.
Larger Bear: Sport-weight yarn (small amount)....Baby Dreams. Smaller Bear: White embroidery floss (1 skein)....Cotton. Ch 5. In 3rd ch from hook work 3 dc, ch 3, sl st into the top of the last dc, 2 dc in same ch as lst 3 dc, skip next ch, sl st into last ch. Cut yarn, pull yarn end through last loop on hook. NOTE: When you ch 3 and attach it to the top of the dc, that is forming the picot that will be the tip of the wing. The starting chain edge is the base of the wing and is sewn to the back of the bear. -Gather upper edge of head and pull up tightly. Stitch. -Sew center back seam of head. -Wrap yarn end around neck of bear 3 or 4 times, and pull up tightly. - Stitch over the neck wraps 2 or 3 times to lock in place. -Fold the leg edges together. With the starting yarn end, sew the leg seam up to the center back. -Stuff body and sew shut. -Sew arm seam, and sew arm to Comfie Bear. Repeat for other arm. -Sew wings to back at shoulders. Optional: Sew a pin to the back and a heart button to the tummy. -Thread yarn ends into a darning needle, and take them inside bear's body. Trim excess ends. -Ears: Push crochet hook into a stitch in the top of the head, yo, pull up a loop onto hook. -Cut yarn, pull end through last loop on hook. -Tie a knot with first yarn end, then thread yarn end into darning needle, and hide yarn ends inside head. -Sew 2 beads on for eyes. -Embroider nose by stitching with straight stitches approximately 6 or 7 times for nose. - Embroider mouth by making a single straight stitch at each side of the nose.